Folks, here is another movie review from Sybil Vasche of a (soon to be?) 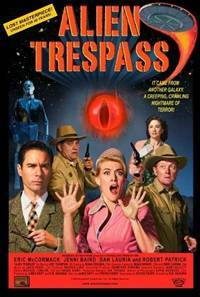 classic B-movie, called Alien Trespass. Side note: Wikipedia has a nice article about the meaning of 'B Movies' and it makes for interesting reading when you have a few minutes. A 'B Movie' was usually the second feature in a two-film presentation, but through the years the 'B Movie' moniker has come to be associated with low budget, badly made movies. I have a newer, more recent classic reflection movie than what we usually focus on called Alien Trespass. It’s more like a homage to 1950s sci fi movies, and didn’t make a big splash when it came out so that’s why I’m including it here. Astronomer Ted Lewis (Erik McCormick) has his body taken over by an alien who is trying to find the dangerous Ghota, another alien that escaped when their ship crashed on Earth. The good alien takes over Ted’s body and enlists the help of a waitress named Tammy to help him find the Ghota before it wrecks havoc on the Earth. Chock full of scenes and in-jokes referring to all those wonderful sci fi movies from the 50s, this movie is a lot of fun and entertaining. The director and producer, R.W. Goodwin was a co-executive producer for the X Files and this is his only film to date. He was inspired by his love of 50s sci fi, and there are elements of It Came from Outerspace, War of the Worlds and Earth vs. the Flying Saucers in this film. As well as the use of lush colors reminiscent of This Island Earth and Invaders from Mars there is great attention to detail in the set designs, costumes and props. You can tell the actors have a great time and there are fun performances, especially from McCormick. He is well known for his role as Will in the popular sit com Will and Grace. I think his talent as a comedic actor is outstanding and hopefully we’ll see more of him. 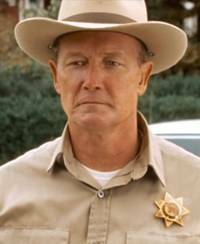 (He’s on my list of “Actors who are Under-rated by Hollywood .”) Also in the film is Robert Patrick, no stranger to the genre (Terminator 2, Fire in the Sky and the X Files) and Jenni Baird (The 4400) who is from Australia but does a great turn as the plucky waitress Tammy. This movie is about 1 hour and 30 minutes long and don't forget to get enough popcorn and cookies to last through this cinematic classic, Alien Trespass. Originally posted on brusimm.com, July 2012.